I’ve always thought it ironic that a man called Greg Horton should be the one who might bring down Great Timmy Leader by exposing the corruption of his evil empire. But it wasn’t until today that I realized how much we owe that RCMP investigator. 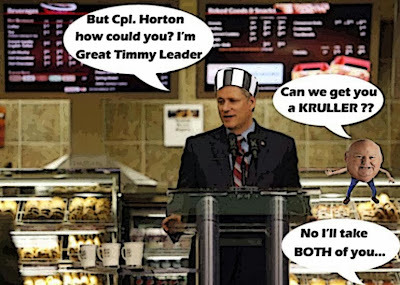 From the Ottawa Citizen: “Mountie investigating the Senate expense scandal, Cpl. Greg Horton, went before a judge on Wednesday to consent to the public release of the Information to Obtain (ITO) a production order he had sworn five days earlier. For not only has he done an extraordinary job so far, and left Stephen Harper’s story hanging by a thread, he has also used the public disclosure to obtain even more documents that might finally snap that thread. The court order Horton obtained with the November 15 ITO compels the Royal Bank of Canada to turn over additional Duffy banking records but also requires the Senate to turn over more than four months of emails sent and received by Duffy and Conservative senators David Tkachuk, Marjory LeBreton and Carolyn Stewart Olsen through their Senate of Canada accounts. And made it almost impossible for those Senators to impede his efforts. Any of the four senators could argue that the release of their emails is a breach of their parliamentary privilege, said former House of Commons law clerk Rob Walsh. But that will be harder for them to do, now that the RCMP has put on the public record the texts of dozens of other emails provided voluntarily by Wright that track efforts by PMO staff and senators to massage a Senate committee report on Duffy’s expenses. You know in recent years the RCMP has come under a lot of criticism, most of it justified. And it remains a deeply troubled organization. But there are some good apples in every rotten barrel. And if the Con regime collapses under the weight of its corruption and criminal behaviour, Cpl. Greg Horton will deserve a huge vote of thanks. For he may be a humble police officer. But his dogged pursuit of the truth in the Kingdom of the Big Lie, and in the face of what must be enormous pressure is admirable. Horton’s own career is very much on the line here. It speaks well for his professionalism and courage (and confidence in his legal case) that he has filed the affidavit at all. A close reading of the document suggests that Horton himself wrote every word of it, with little or no help from others. It contains several grammatical errors and typos, and he consistently spells “publicly” as “publically.” But he is clearly a cop, not a copy editor; these errors do not detract from his evidence, which he has meticulously footnoted. For can you imagine how much the Harperite gang must hate him? And the sad truth is that if he hadn’t done such a good job, and allowed his findings to be made public, we would still be wandering around in the dark, and the Cons would still be getting away with it. Instead, thanks to him, some of the most powerful people in this country are shivering in their boots, or running for cover. Conservative Senator Irving Gerstein refused to answer questions about his alleged role in the Senate expense scandal Thursday, the day after a police document claimed he tried to stop an audit into Mike Duffy’s expenses. And when this is all over, if charges are laid, and the Con regime collapses, or is jailed, Cpl. 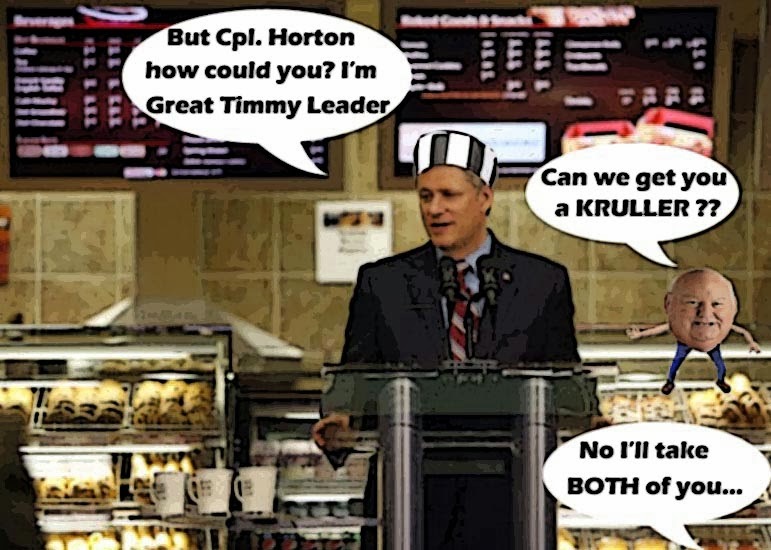 Horton will be my special nominee for the Order of Canada. Or just my Canadian hero. For showing me that all is not rotten in Harperland, that one honest man is worth a thousand crooks, and that we were right to demand better for our country. Hey !!!!! Gimme a Duffy cream pie, and a big Harper bagel….TOASTED. Just for the record, publicly and publically are BOTH acceptable … so our RCMP officer is even more on the ball than you give him credit for and, as far as grammar and spelling are concerned, you too.